Admittedly, I ran a mobile voice search Sunday morning asking Google: "What time does the Super Bowl start?" The question on google.com through its Knowledge Graph technology directs you to an instant answer in the results rather than requiring a series of clicks through embedded links leading deep within a Web site. Ask the same question Monday and get the Ravens and 49ers scores. To take advantage of mobile, search engines and app developers must allow those searching for information to accomplish a quick task. I'm with my laptop most of the day searching the Web or writing articles for MediaPost, but when it comes to asking a specific question I grab my iPhone, launch the Google voice search app and speak the query. That's the future of search: mobile queries providing click-to-call options, directions and direct links to Web sites. During the Super Bowl, 91% of viewers used their mobile devices during the commercials -- most responding to the ads -- but only 35% reported completing a follow-up action on their phones after an ad aired, according to data from the Mobile Marketing Association and mobile ad company SessionM. The finding, which come from a study series that SessionM and the Mobile Marketing Association (MMA) will jointly release called mPulse or Mobile Pulse, suggests that brands are not capturing consumer demand. While the majority of respondents did not take action on their mobile devices based on a commercial during the Super Bowl, they would like to do so. Most of the TV commercials did not present a clear call to action. Some 21% admit they would like to see more commercials inviting them to do something on their mobile device and rewarded them with something, such as content or coupons. 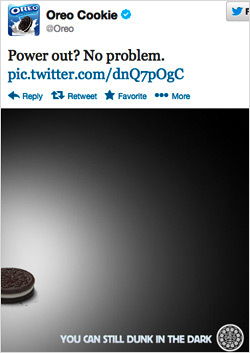 The Oreo Cookie ad clearly drove consumers online, where marketers for the brand took advantage of the blackout during the game, tweeting on Twitter "Power out? No Problem. You can still dunk in the dark." The post tweeted 15,171 times as of Monday and was favored by 5,360. The stats also support Nielsen's findings released in 2012, linking social and mobile to television. They suggest 41% of tablet owners and 38% of smartphone users use mobile devices when watching television. It's become clear that mobile search continues to become the future in determining intent, where consumers want to carry through a task. Although mobile search was once considered a nerdy task, Orbitz VP of Mobile Chris Brown told HuffPost that in December more than one-fourth of its hotels were booked through a mobile device. Reaching for the phone to search for something continues to be so much easier than searching by traditional means.